I have been making this for several years now and it is ALWAYS a huge hit at my Thanksgiving dinner! 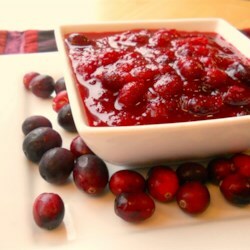 Even people who don't normally eat cranberry sauce seem to enjoy this. I have learned over the years a few little secrets to perfect this recipe... First, use half cup of white sugar and half cup of brown sugar. Second, add a few pinches of cinnamon to your desired taste. Other than those couple of things, make it as directed. It really couldn't be easier or any more delicious! Trust me, you will never go back to the canned junk again!! !